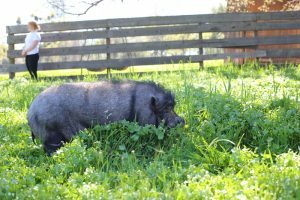 Wilbur and Anastasia are two lucky pigs. 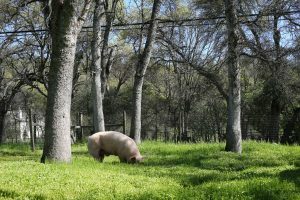 After spending years living at a northern California “sanctuary” and rescue, the two are safe and sound at Animal Place where they can experience life as pigs should. Wilbur is large, pink, and loves humans. He spent the past five years in a 20×30′ dirt pen with no enrichment. His muscles are weak from lack of exercise and he suffers from an untreated fungal infection in his ears. Anastasia the potbellied pig spent the past decade in a 15×20′ dirt lot. She is severely overweight and can barely see, the skin around her face has folded over, obscuring her sight. Because she has not been allowed to forage, her lower teeth have not worn themselves down, now pointing awkwardly out of her face. 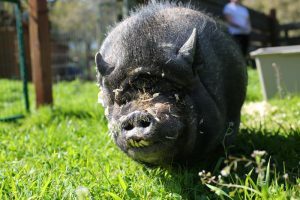 Animal Place took on the responsibility for Wilbur and Anastasia after the horse “sanctuary” where they lived stopped operating and animal control took legal custody of all the animals. While the horses found safe haven with permanent homes or other equine rescues, Wilbur and Anasatasia were left without placement. YOU guys are awesome at the sanctuary! i cannot tell you how wonderful it is to see your e-mails – they are so heart warming in a world that most often is not warn and receptive to so many animals. it is so heartbreaking to read and see how these poor animals are treated – it causes me much heartbreak and depression. you people at animal place are doing such magnicent work – do not ever forget that. we people at the other side of this country thank you from the bottom of our hearts. THANK YOU so much for taking care of these BEAUTIFUL animals!!! I am smiling ear to ear after watching your video… WELCOME HOME to Wilbur & Anastasia!!! I completely again how awesome for these souls! Brought a smile to mile face and happy watery eyes! Thank you to all involved!!!!!!!! and I saw God in them…. So glad thse two sweet souls will be able to have enough space to roam. 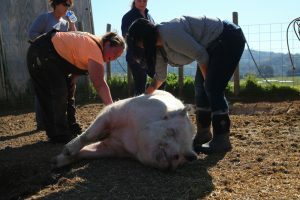 I hope Wilbur will be able to enjoy his new life without so much pain. They are both adorable. Your love and compassion are truly remarkable. Too many animals are subjected to cruel and undeserved punishment. Anastasia and I am sure they are going to be very happy in their new home. you are doing a heartfelt and worthy job. thank yiu. Thank you for rescuing these precious babies! Thank you for rescuing these gentle souls! It is delightful to see these two lucky pigs arriving at such a wonderful sanctuary! Thank you for taking them in and thank you for sharing! 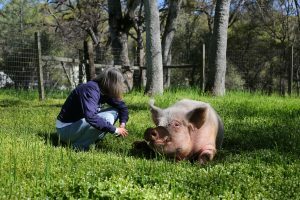 Bless you for saving these pigs and all of the wonderful work that you do!!! You are Angels!! soo beautiful to see! thank you for the amazing work you do!! Thoink you, thoink you, thoink you! Every time I see these beautiful animals I am reminded there is a God and wonder how so many are blind to it. Am so glad you are not. Welcome to your new home Wilbur and Anastasia! May you live your life in peace and harmony with you new Animal Place family.